Often though people don’t have sufficient space, which why I’m hoping to open up some of the City of Bayswater public land and allow residents to produce food. 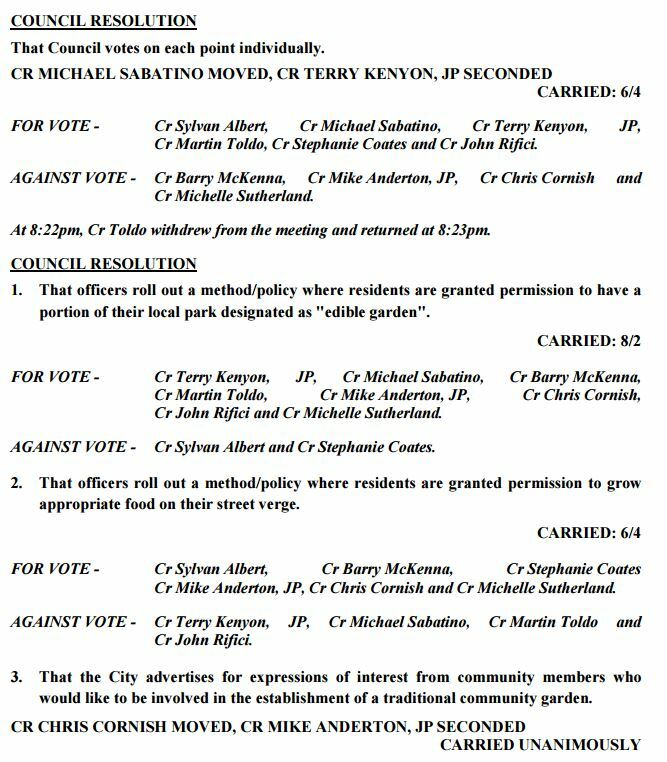 That officers roll out a method/policy where residents are granted permission to have a portion of their local park designated as “edible garden”. That officers roll out a method/policy where residents are granted permission to grow appropriate food on their street verge. That the City advertises for expressions of interest from community members who would like to be involved in the establishment of a traditional community garden. Whilst liaising with Greg Smith, Bayswater Urban Tree Network’s spokesperson, he showed me how his street had gradually been planting food producing plants in an innocuous corner of their local park. Specifically, the local community can, and do, pop by and pick up some capsicums, basil, guava, pomegranates, bay-leaf, oranges, lemons, figs and quince. Despite being of the opinion that it is probably illegal to do this, I did find it a fantastic idea. It cost the City nothing yet we have a great community project which is bringing people together, making good use of an otherwise empty space and saving residents money. I am hoping that the City will initiate a simple, red-tape free, process where if, say, 5 households apply for a portion of their local park to be designated “edible garden” they will be able to plant food producing plants. In addition to the ones already mentioned they could include almonds, figs, macadamias, loganberry, mango, avocado, chestnuts, apricots and a variety of herbs and vegetables. I’m not supporting this to occur where there is lawn or in the middle of a park, more so on the perimeter if there is a (preferably reticulated) garden bed with sufficient surplus space. Why shouldn’t people be able to grow a veggie patch, or similar, on the verge? There needs to be limitations on the height of any plants so that there is no visual impediment for neighbouring cars pulling out onto the road, so corn may not be appropriate. But other than that it makes sense to allow this verge land to be used in a productive way; this is especially the case with all the urban in-fill which is occurring as residents often have no land available to grow food. As a student of economics, I believe in utilising scarce resources, such as land and water, to their full potential. I am hoping that the City will initiate a simple, red-tape free, process where households either have blanket approval or apply for permission and accept any rules which the City officers believe are necessary. I’d like this concept embraced and promoted by the City. 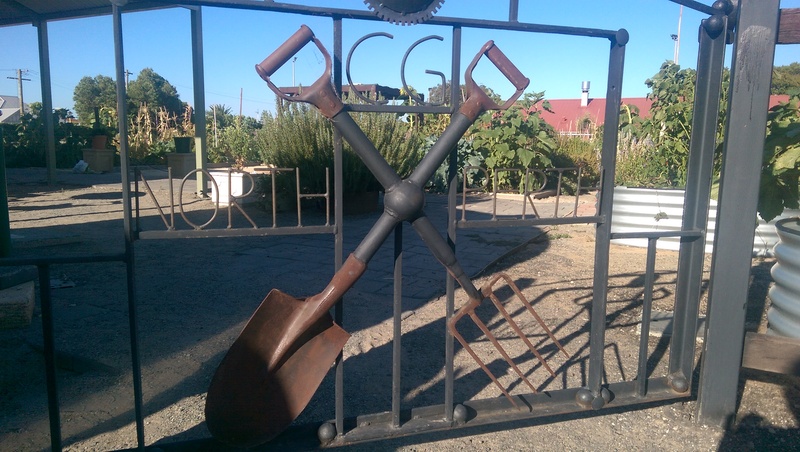 A number of local governments are establishing traditional community gardens. These are basically where an area has been setup and provided with a decent shed for the storage of garden tools, preferably power and also a water tank. Residents then become members and can pay a small fee to be allocated a “plot” or an even lower fee to participate in a “shared plot.” Because of my interest in this topic I was invited to meet Colin Scott and the management team at the North Perth Community Garden. They have a very impressive set up. The City of Vincent should be congratulated for their involvement and vision in making it happen. 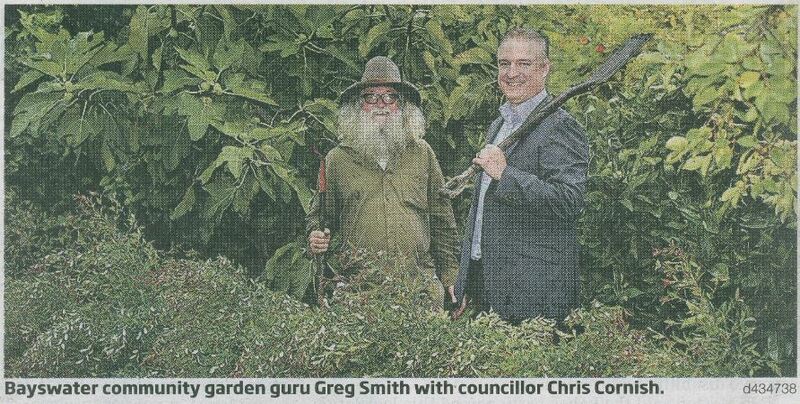 The community garden is adjacent to their Men’s Shed and this has created synergies. I believe Vincent invested about $25,000 into the community garden and it is working well. I have no doubt though that it must be community driven; I don’t think it will be a success is the City of Bayswater proceed down this path by itself. That is why I’d just like to see the concept be advertised and explore whether there are enough residents who say they are prepared to commit to the project and help it be a success. I am sure that the team at the North Perth Community Garden would be prepared to provide advice and guidance to interested Bayswater residents. The world is unfortunately on the cusp of a food shortage and currently the world’s fifth-largest food supplier is running out of water. Australia is the ‘lucky country’ and I don’t envisage food shortages to hit us, but prices will have to go up in order to stop producers exporting all their produce overseas. I am hoping the above ideas will at least provide some respite from price increases, allow residents to make the most of one of our resources (land) and build a tight-knit community. Just think, if these motions are successful, the City of Bayswater really will be ‘The Garden City’. 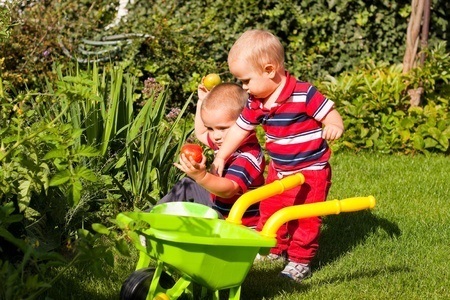 Gardens grow good food, healthy kids and provide important economic savings. Since my further research, the importance of this concept has become more pronounced. I would like to know what is happening in the Bayswater council regarding the planting on the verge of edibles. I know some people that do this and it is getting so popular in many areas of Australia and overseas. I have been told that they may have to remove these veges and replace with pebbles etc. That seems to me to be so ridiculous. I hope that the Council does not go ahead with these backward policies. Seems ridiculous to me as well Dianne. This is why I have moved that we officially allow people to use their verges to grow food. It will be voted on at the next council meeting – 28th April. Have you had much feedback on this? Would be interested in doing a blog on it too. There has been a colossal amount of feedback; more than anything else I have experienced. The vast majority seems to be centered around allowing verges to be used for food production rather then what I thought would be the big one – allowing a portion of parks to be used for food producing plants. I certainly hope the Council votes in favour of my motions, because it certainly appears to be what the people want. I grow veggies in my front garden and the amount of people who say hello or stop and chat is amazing. Gardening and plants make us friendlier, better people. Thank you Cr Cornish for initiating this practical and fun move towards building community. Hi Tessa, Thanks for sharing your experiences. It is truly great to hear that your veggie patch stimulates discussion and essentially builds community togetherness. Hopefully the passers-by will replicate what they see and ‘propagate’ the concept to others as well. Love the idea that leadership in the community be responsible to take the opportunity to grow the community. Food on the verge is a wonderful statement as to who we are and what opportunities future generations will have. Safe streets where children and neighbours can meet and eat. Let the joy of growing be shared and promoted! Well done. Thank you. Thanks for your comments Jason. Let’s hope the vision you describe can become reality.